It’s amazing to think of the day of one’s death as a good thing. But, this Good Friday is good because the only One who is good, became sin, so that in Him, we are aren’t good might become good. It’s an amazing exchange. I hope you have a great day admiring Jesus for what He’s done to make you good. If you’re able, join us at Crestview tonight as we celebrate Good Friday at 6PM. On Thursday night in Gethsemane, Jesus was arrested—betrayed by one of His own disciples and abandoned by the others. The Chief Priests and the Sanhedrin called for secret trials in the dead of night, and the verdict handed down was that Jesus would be crucified. This was something the Roman Prefect, Pontius Pilate, would have to execute. And reluctantly, he did. After a severe beating, Jesus was nailed to a cross where He’d remain for six hours until dead. Never before or since had more been lost and gained at the same time as at Jesus’ crucifixion. The world gained the atoning sacrifice of Christ. But for those present, either the significance of the moment was lost on them or their hearts broke because the One they believed to be the Savior of the world was dying at the hands of Rome. They couldn’t stop it and they didn’t realize it was for them. They hoped in Him, and though He had told them He would suffer many things and rise three days later, (Mk 8:31) how could they have possibly known this was what He meant? As we prepare to celebrate Christ’s resurrection, we turn our eyes to His death. 1. What happened to Jesus before the cross? 2. What do you think Jesus was thinking and feeling? 4. What did they do with Jesus’ body? 5. What did Jesus have set before Him that helped Him endure the cross? As you finish talking, it might be quiet or somber or more serious. Don’t feel rushed to change that. Let the death of Jesus weigh on you as you wait for Sunday – the day we celebrate that Christ has risen and is alive, the day that shows He has authority over sin and death. Amen! Ponder what these events mean and seek to glorify Jesus as you join others to worship tonight. 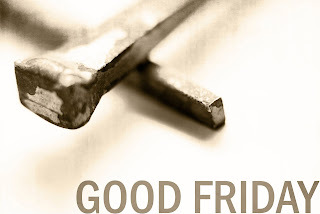 If you’re able, please join us at Crestview for our Good Friday Service at 7PM. …especially tonight at Good Friday Services. Kevin DeYoung has an excellent post today on paying attention to the familiar, which has many similar emphases as I had in my sermon this past Lord’s Day on Drifting. We began with Good Friday service at UVBC and enjoyed a great night thinking about the cross and fellowshipping with others. On Sunday morning, I read Isaiah 53:8-12 and we sang “Come People of the Risen King” to bring in our morning festivities. After this, we had a church wide brunch, then Sunday School (my class watched Piper preach a sermon: I Have Seen the Lord), then AM Worship. I thought we had an amazing day and I hope we can continue to be shaped by the resurrection. One of the biggest weekends in the life of our church happens this weekend as we celebrate the Gospel: Jesus life, death and resurrection.